Dementia, including Alzheimer’s disease, is characterized by cognitive decline and decreased brain function. Recent scientific studies have investigated the role of nutrition in dementia and have provided suggested nutritional changes for those at risk for dementia. This book discusses nutritional interventions that can promote brain health to decrease the risk of developing dementia as well as slow the progression of the disease in those diagnosed with dementia. If you or your loved one are at risk for developing dementia, following the guidelines presented in this book can help you maintain your brain health and fight against the onset of dementia. If you or your loved one are already diagnosed with dementia, this book will provide insights into nutritional changes that may slow the progression of the disease, and it also presents tips for helping your loved one with severe dementia maintain adequate nutrition when eating becomes difficult. 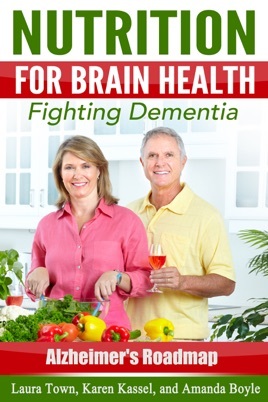 This e-book helps to offer ways to eat healthy to prevent Alzheimer's or to delay symptoms.